The UFC is a different breed when it comes to competition as it features the best of the best and can essentially be seen as the major leagues of MMA. There are plenty of promotions that are big and separate of the UFC but none feature the same amount of competition than the UFC. For that reason many fighters consistently see the UFC as the place they want to be to truly test themselves. That level of competition has been proven time and time again as fighters that have won titles in every other promotion they have been in cannot find their way to a title fight in the UFC. They quickly realize that the UFC is a step up in competition but it also provides some of the most competitive athletes in sports a challenge to overcome. From world class boxers to nationally recognized wrestlers, anyone who is interested in mixed martial arts has one goal in mind, making the UFC roster and winning a title. That was true for one of the best kickboxers in the world whose kicks were so devastating that the saying “right leg hospital, right leg cemetery” was used every time he stepped into the ring. Mirko Filipovic, better known as Mirko Cro Cop, was a serious striker who had grown in legend in the early days of MMA. Starting out in K-1 he quickly made it into Pride where he rose to the top of the heavyweight division. While at Pride he fought everyone there was to fight and beat almost all of them. The successes including winning the heavyweight tournament in 2006 when he forced a submission of current UFC heavyweight Josh Barnett via strikes. His time in these promotions had built that legend of Cro Cop as one of the best heavyweights in the world. As one of the best in the world it was no surprise that he was eventually going to find his way to the UFC and after eight years fighting through Pride and Dream in Asia he made his UFC debut in 2009. There was something to the fact that Cro Cop was an older fighter when he went into the UFC but many saw this as his best chance to achieve what most fighters want, a UFC title. His first fight was a great success when he showed that the hype was real in beating Eddie Sanchez in a first round knockout. That impressive showing rocketed him up the rankings in the heavyweight division and in only his second fight in the UFC he was given the chance to earn a title shot. He was set to take on a young Brazilian fighter who not many had heard of but had risen quickly after three straight wins in the UFC. Many saw the fight as simply an easy step for Cro Cop to find his way to the title where he could prove to be one of the best fighters in the world. His experience and his massive kicks were going to be too much for this young fighter and in the end he was going to move on to fight for the title in the UFC. Nobody told that to his opponent Gabriel Gonzaga though as he went into the fight with the confidence that comes from a run of three straight wins. As both fighters faced off it didn’t take long for everything to change for the legendary kickboxer. In one of the most devastating knockouts in UFC history, Gonzaga reached up with a massive head kick that sent Cro Cop to the mat in a very awkward position. It was a huge knockout and remains one of the biggest in UFC history but, unfortunately for Cro Cop it is what he has become known for in the UFC. After that loss Cro Cop saw another loss and moved back to Japan to fight in Dream and K-1 before returning to the UFC where he went 3-4 and once again found his way out of the promotion. Now he returns to the UFC and gets the chance to get some revenge for the highlight, or lowlight for Cro Cop that has defined his career in the UFC. There may not be much time for Cro Cop left as the 40-year-old is nearing the end of his career and could be entering the UFC simply looking to get that revenge in this fight. Not much has changed for both fighters in how they go about their fights as “right leg hospital, left leg cemetery” remains the mantra for the Croatian. Gonzaga meanwhile remains a tough striker with a BJJ black belt that doesn’t care where it goes in most fights. Both fighters entered the octagon for their own reasons but for Cro Cop it was clear that he wanted to erase that blemish on his record and prove that he is one of the greatest fighters ever. There is no doubt that in the world of MMA he is a legend but in the UFC he has yet to establish himself and getting this win over Gonzaga was going to be a massive step towards solidifying that legend in the sport’s top promotion. It was clear from the start of the fight that Gonzaga was looking to take the fight to the ground where he could use his BJJ while Cro Cop wanted to keep it standing. 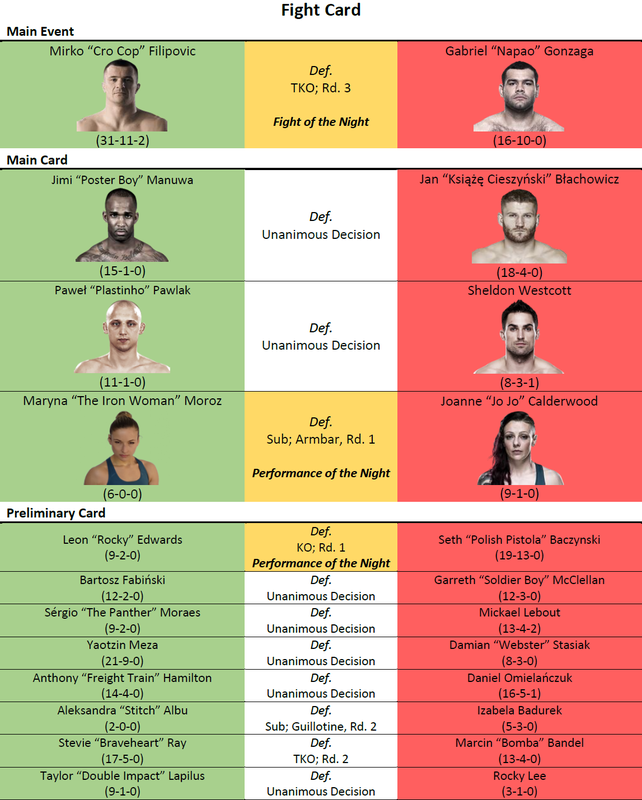 Gonzaga got his way more often than not at the start f the fight as he continued to earn takedowns against Cro Cop and kept the fight on the ground. 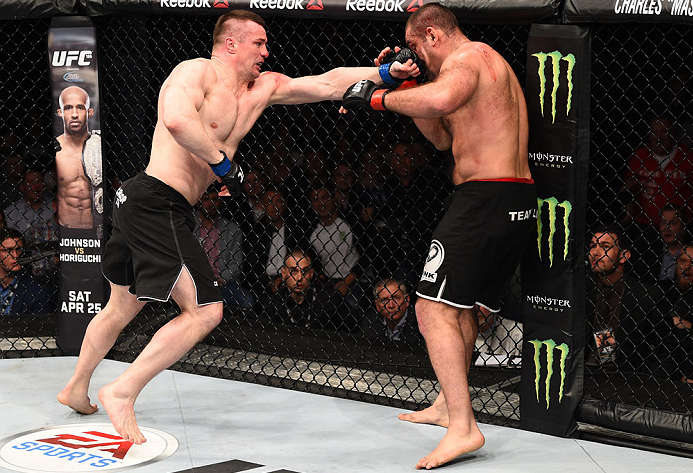 Cro Cop did plenty of damage while on his back though unleashing elbows that cut Gonzaga in the first round. The second round saw much of the same except this time it was Gonzaga’s elbows that cut Cro Cop as the Brazilian earned plenty of damage from the mount. The third round saw Gonzaga attempt the same thing but Cro Cop stayed back and avoided the takedown attempts. With Cro Cop still standing and Gonzaga looking to take the fight to the mat both fighters clinched with Cro Cop getting the advantage. A big right hand had Gonzaga wobbly while in the clinch and Cro Cop eventually backed off and began unleashing combinations that had Gonzaga moving backwards. With Gonzaga down after Cro Cop’s barrage the Croatian jumped on the chance and began unleashing elbows and punches form the top forcing the referee to stop the fight. So it was that Cro Cop got his revenge for the biggest loss of his career and was given new life in the UFC. Gonzaga’s loss could be devastating as it is now three straight losses against good fighters proving that he may not belong in the UFC or at least anywhere near the title. The win for Cro Cop was eight years in the making and at 40 he now looks for what will likely be his final chance at a UFC title. The finish was impressive enough that he will likely be back in the UFC again but he will need to string together a few good wins if he hopes at a title shot before his time is done.